I have collected over the years several sources to use with the Feelings Theme. I also recently have started incorporating Conscious Discipline into my prekindergarten classroom. This upcoming school year I have designed several games and visuals for the children to use along with Conscious Discipline. The information below is a few of my ideas and ideas friends, and colleagues have shared with me over the years. Several of my printables are FREE and can be downloaded from TeachersPayTeachers.com. I try to keep all of my teaching resources in one area to make it easy for myself and others. I hope you find the information useful. If you have any questions or comments do not hesitate to email me or post a comment. Suggestions and comments are always encouraged and helpful. Directions: The children look in the mirror and make a happy face. 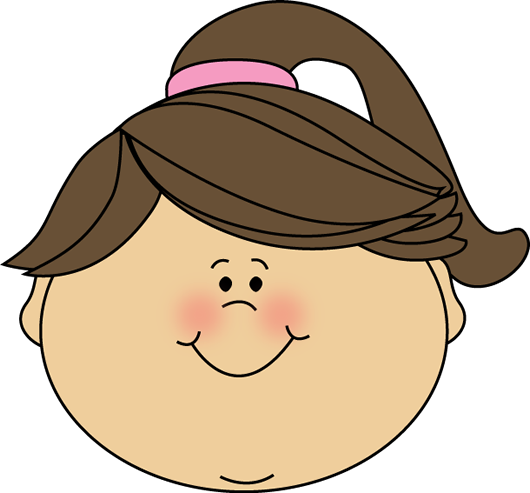 They draw themselves on one side of the plate or circle including eyes, nose, and hair then and smiling mouth. On the opposite side they draw themselves with a sad face. Glue craft stick on the bottom. 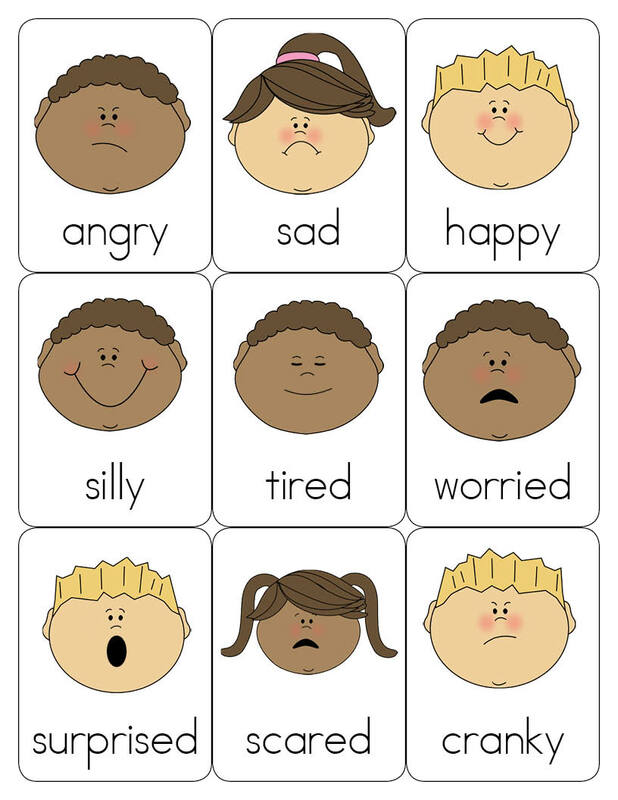 Extension: Use these at circle time or a large/small group time later in the day asking questions about feelings. They turn their "faces" to show the side that corresponds to the question or statement. Examples: You need to go to clean up the centers. Are you happy or sad? You find your favorite toy that you thought was lost. Are you happy or sad? Free art expression. When they are done, ask them to name their picture with a feeling. Hang paintings with their descriptions. The packet contains four blank faces for young children to use playdoh to build how they feel faces. 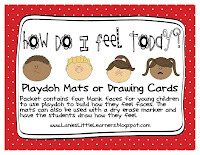 The mats can also be used with a dry erase marker and have the students draw how they feel. I am using the mats in my Safe Place area based on Conscious Discipline to encourage children to identify how they feel. 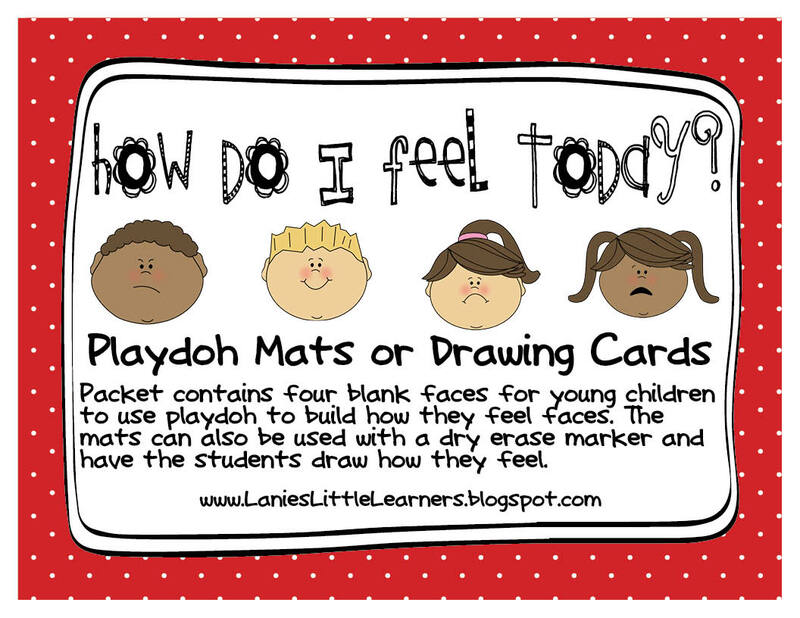 I am also introducing the activity mats as part of my Feelings Theme to use at the beginning of the school year. Directions: It is suggested to print on card stock and laminate for durability. Then cut out each face and place in your center. You could also print on card stock, glue in a file folder, and laminate the entire set. DOWNLOAD>> How Do I Feel Today? Directions: Mash, knead, squeeze, pound, pinch, etc. all ingredients in a large bowl until completely blended. Form into small balls about 1 to 1 1/2 inches in size and place on an ungreased cookie sheet. Butter the bottom of a small juice glass and then dip it into white sugar, then pound the cookies flat with it. Bake the cookies at 350 degrees for approx. 10-12 mins. Directions: Sit the class in a circle and show them the ordinary apple. Then pass the apple around in the circle and instruct the students to lightly hit the apple on the carpet. Once all of the children have had a turn, show the apple to the children. Ask the children does the apple look any different? What do you think happened to the inside of the apple? Explain to the children that the apple looks normal on the outside, but on the inside it is bruised. Cut the apple open and pass the apple halves around the circle letting the children examine the bruised inside. (Remind the children the apple is for looking and not eating.) Explain to the children that sometimes we cannot see how our words or actions hurt our friends on the inside, but like the apple our friends can be bruised on the inside by what we say and do. Extension: Have the children draw a picture of how they can make a friend feel better when someone says something mean or hurtful. Materials: CD player, recorder, pictures of children showing various emotions. Directions: Record the children making different sounds such as laughing, giggling, growling, crying, yelling, etc. Place the CD in the Science area along with pictures of the different emotions. The children then listen to the sound and match the emotion. Experiment to show what happens when we bottle up anger and emotions inside....we EXPLODE! Materials: vinegar, baking soda, paper towel, gallon size ziploc bag. Experiment can be found at All Things Beautiful. Materials: Digital camera, computer, and printer. Directions: Ask your children (one at a time) to give their best happy, sad, mad, silly, and scared faces. Then take a picture of them. Print pictures and glue them on an 8.5”x 11” paper. Either type the words that describe the emotion or write the words directly on the paper. Combine all of the children’s faces into a class book. You can either secure using comb-binding if accessible OR punch three holes and secure using book rings. 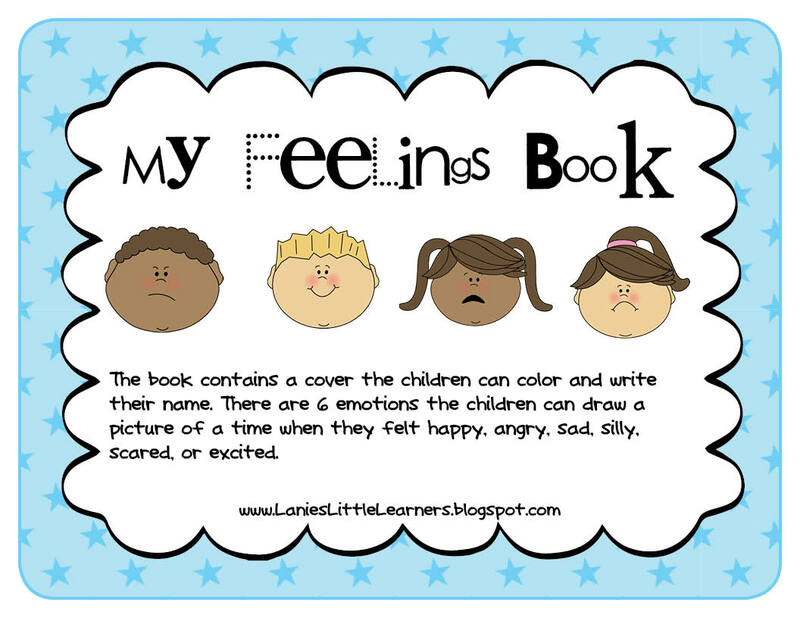 You can use the class book to lead a discussion about different feelings. Materials: Today I feel Silly by Jamie Lee Curtis, sets of faces made with paper plates showing different feelings, and a puppet. Instructions: Read the book. Give each child in your small group a set of plates. Using a puppet, retell few situations that happened in the story. Have the children choose a paper plate to show how they think the character feels. 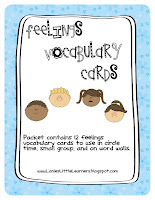 Feelings Vocabulary Cards: The packet contains 12 feelings vocabulary cards perfect to use in circle time, small groups, and word walls. 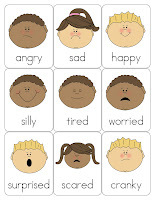 I am using the Feelings Vocabulary Cards in my Safe Place area based on Conscious Discipline to encourage children to identify how they feel. 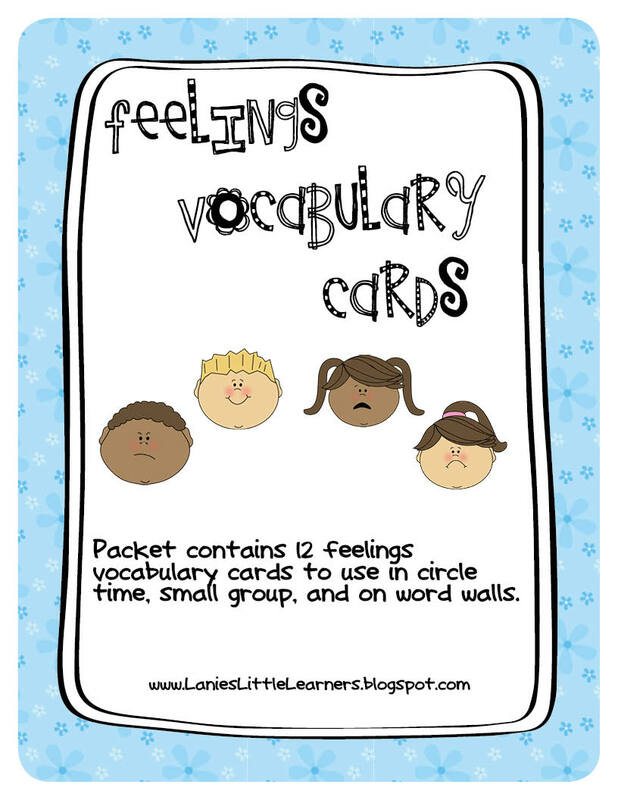 I am also introducing the Feelings Vocabulary Cards as part of my Feelings Theme to use at the beginning of the school year. Directions: It is suggested to print on card stock and laminate for durability. Then cut out each vocabulary card along the solid black line. On each page write an emotional word: angry, happy, sad, scared, silly, and excited. Encourage the children to draw a picture of something that made them feel angry, happy, sad, scared, silly, and excited. Write down their story when they are done and display. and math centers. I am using the Feelings Sorting Cards in my Safe Place area based on Conscious Discipline to encourage children to recognize facial expressions. 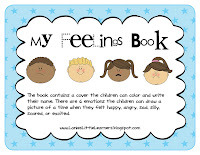 I am also introducing the Feelings Sorting Cards as part of my Feelings Theme to use at the beginning of the school year. 1. Flower Shop – Plastic flowers, non-breakable vases, play money, cash register or something to store money in, notepad for taking orders, wrapping paper, and gift bags can be placed in the dramatic play area. Make a sign that says “Flower Shop.” Also, make a sign that has prices for different types of flowers. You can use a digital camera and take pictures of the plastic flowers. Print them out, glue onto a poster board and write the amount. For small children I would also include a picture of the money for the children to match up. The children may want to arrange, sell, deliver, and receive flowers. 2. Card Shop – Include blank cards, thank you notes, paper, pencils, crayons, markers, construction paper, glue, scissors, stickers, envelopes, and self-inking stamps. Make a sign that says, “Card Shop.” You can also include pre-printed strips for children to copy on their cards such as: I hope you get well soon, Thinking of you, Miss you, Sorry that you do not feel good, Good Job, etc. Also include sentence strips with both each child’s name and picture. This way the children can find a child’s name and write it on the card. 3. Post Office – Include a bag to be used as the “mail bag,” a blue shirt for the mail carrier uniform. Use the cards created from the card shop. Make a sign that says, “Post Office.” The children can use stickers to stamp their cards and deliver them to their friends via their cubbies. Below is a list of books to go with the Feelings Theme. I have a majority of the books in my collection or I check them out from my local library. Glad Monster Sad Monster A great link to use with the book. The site has a lot of FREE printables to accompany the book. I am really glad that you like the Preschool Feelings Unit. Awesome..i love all the activities..please continue with the other themes...thank a lots..